In Colorado, a person (developer) may need a Colorado Construction Dewatering General Permit (General Dewatering Permit) from the Colorado Department of Public Health and Environment (CDPHE) Water Quality Control Division (WQCD) “anytime groundwater, including groundwater that is commingled with stormwater or surface water, is encountered during construction activities where the groundwater or commingled water needs to be discharged to surface water or back to the ground.” Construction Dewater Activities Frequently Asked Questions, at p.1. Construction dewatering source water means “groundwater, surface water, and stormwater that has mixed with groundwater and/or surface water (i.e. commingled stormwater runoff) that has come into contact with construction activities.” Construction Dewatering General Permit, at p. 5. Construction activities include ground disturbances such as “clearing, grading, excavating, demolishing as well as installation of new or improved haul and access roads, staging areas, stockpiling fill materials, and borrow areas.” Code of Colorado Regulations 5 CCR 1002-61, Colorado Discharge Permit System. The Colorado Department of Public Health and Environment (CDPHE) Water Quality Control Division (WQCD) regulates discharges associated with construction activities under Colorado Water Quality Control Act (Colorado – C.R.S. 25-8-101 et seq.) and Code of Colorado Regulations 5 CCR 1002-61, Colorado Discharge Permit System. Note, a developer may not need a General Dewatering Permit if the developer already has a Colorado Construction Stormwater Permit and meets specific conditions addressed below. Construction Dewater Activities Frequently Asked Questions, at p.1. 6-CO-e.1 to 6-CO-e.2 — Is the Project Activity Covered by a Stormwater Construction Permit? The groundwater being pumped is not contaminated to exceed State groundwater standards. Construction Dewater Activities Frequently Asked Questions, at p.3. Note, a Stormwater Construction Permit only covers discharges composed entirely of stormwater. If any portion of the discharge is non-stormwater (i.e., process water to surface water) a General Dewatering Permit is required. Colorado Stormwater Management Plan Preparation Guidance, at p. 12. The Colorado Department of Public Health and Environment (CDPHE) Water Quality Control Division (WQCD) encourages the developer to schedule a pre-application conference and site inspection with the WQCD. The WQCD would evaluate the proposed discharges and identify needed background information required for a complete application. 5 CCR 1002-61.5(1)(b). The developer must submit a complete Colorado Construction Dewatering General Permit Application to WQCD by mail or hand delivery at least thirty (30) days before the anticipated date of discharge. Construction Dewatering General Permit, at p.6. 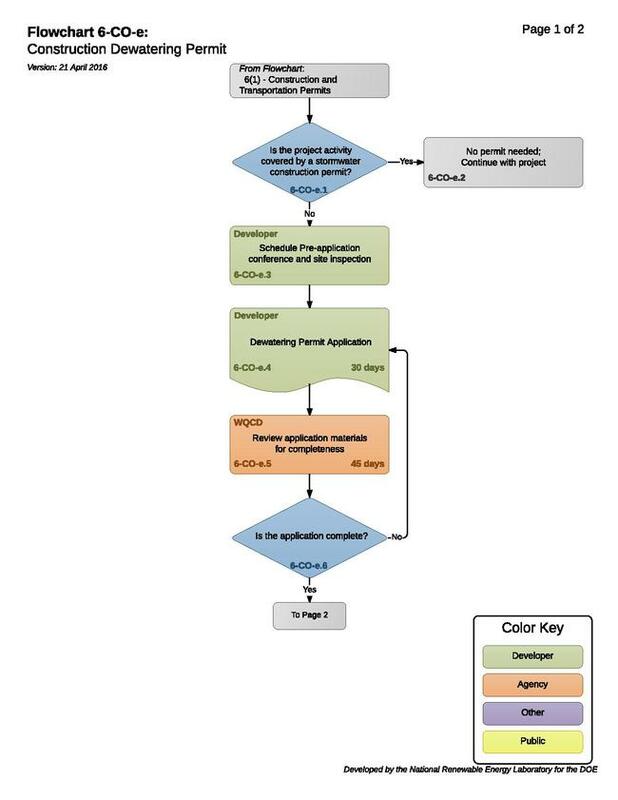 The WQCD reviews the application within forty-five (45) days after receipt of the application for completeness. The WQCD will notify the applicant (developer) within ninety (90) days after receipt of the application whether the application is complete. If the application is incomplete, the WQCD may request additional information. The WQCD will not begin to process the application until they receive all of the required information. The 180-day deadline for the WQCD to issue a permit may be extended by the number of days that an applicant (developer) takes to submit additional information requested by the WQCD, plus fifteen (15) days provided to the WQCD to evaluate the additional information. 5 CCR 1002-61.5(1)(c). If the WQCD determines that the discharge does not fall under the authority of a General Dewatering Permit, then the information received will be processed for an Individual Dewatering Permit or the applicant (developer) may apply for coverage under an alternative general permit. The WQCD will notify the developer of this determination. Construction Dewatering Permit, at p. 6; 5 CCR 1002-61.9(2)(b)(iii). The WQCD will prepare a preliminary analysis and tentative determination to issue or deny the General Dewatering Permit and advise the applicant (developer) of that analysis. 5 CCR 1002-61.5(2)(a). If the analysis is to issue a permit, the WQCD will prepare a draft permit with terms and conditions. 5 CCR 1002-61.5(2)(b). The WQCD must publish notice of the Draft General Dewatering Permit in accordance with 5 CCR 1002-61.5(2)(e)-(h). Any interested persons may submit written comments to the WQCD on the Draft General Dewatering Permit within thirty (30) days from the date of notice of the WQCD’s Draft General Dewatering Permit. 5 CCR 1002-61.5(2)(d). Any interested person may also request a public meeting pursuant to 5 CCR 1002-61.5(3) within thirty (30) days from the date of notice of the WQCD’s Draft General Permit. Holding a public meeting extends the period for public comment from thirty (30) days to sixty (60) days. 5 CCR 1002-61.5(2)(d). 6-CO-e.11 to 6-CO-e.12 — Does the WQCD Approve the Draft General Dewatering Permit? 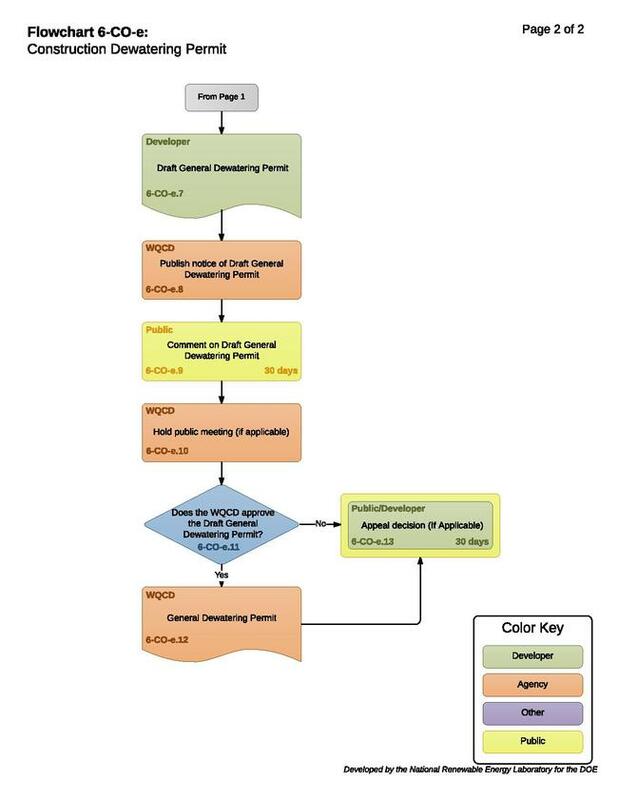 If the WQCD approves the Draft General Dewatering Permit, the WQCD develops a General Dewatering Permit for the discharge and issues it to the developer. The WQCD will generally issue a General Dewatering Permit for a period no longer than ten (10) years. 5 CCR 1002-61.1(4). General Permits must comply with the Discharge Permit System Regulations and the terms and conditions of the issued permit. 5 CCR 1002-61.1(4). Any party directly affected by a final order or determination of the WQCD may apply for a hearing with respect to such order or determination. Colorado – 25-8-403, Administrative Considerations. An “application affected or aggrieved by the WQCD’s final determination may demand an adjudicatory hearing within thirty (30) days of the issuance of the final permit determination.” 5 CCR 1002-61.7(a).